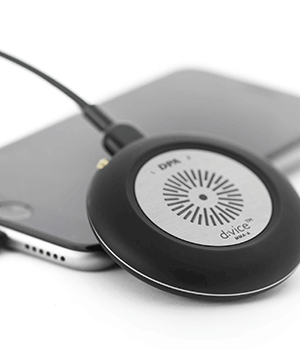 Enter the DPA d:vice MMA-A digital audio interface. A relatively new product on the market that makes your iPhone (or any iOS device with a lightening port & iOS 10 or later) a high-quality, dual-channel microphone preamplifier and A/D converter that captures crystal-clear audio for recording professional audio in the field. Whether that be ambient sound or in our case interview situations. You can also use the USB interface to connect to your laptop (MacOS or Windows). Physically it’s a small light round object about the size of an Oreo biscuit with two MicroDot connectors for attaching your mics, we are using 4060s but you can attach a variety of mics from the DPA range for your application. It’s supplied with a micro USB - Lightening cable to connect your iOS device. We are also using microdot extension cables to give some distance between the two mics Standard cable length is 1.8m and the extension adds 5m to this. Once you have downloaded the app from the App Store you’re ready to configure the system. Set it up as Sum, stereo or dual channel mono, Low cut and high pass filters, and lock the settings so that your third-party apps cannot change them. You will probably have more than one preferred setting so they also offer 4 presets. It’s probably enough to say that this point that the d:vice converts your iOS device into a very capable audio recording tool with astounding improvements in audio clarity. We should however shed some light on the third party apps that make it really useable. For audio only recording, folio, atmos etc. we found the JustPressRecord app fantastic. It plays well with the d:vice and you can choose file type M4A (AAC), AIF, or WAV and Sample rate between 16kHz, 44.1kHz & 48kHz. The first install resulted in some ‘clicking’ in the recording but after re-installing the app, it provided great results. As we are in the business of video however, it comes down to FiLMiC Pro. This app makes the DPA d:vice worth every penny. FiLMic Pro allows you to get the best images from your iPhone but without decent audio, those video files are pretty much useless. Record up to 96kHz (I chose PCM 48kHz) and you have a great portable video camera with excellent audio abilities. The d:vice is not cheap, a kit with two lavaliere mics is over £1k (£500 if you have mics already) but if you want serious recording abilities on your iPhone, making it a professional audio tool, it’s worth it.